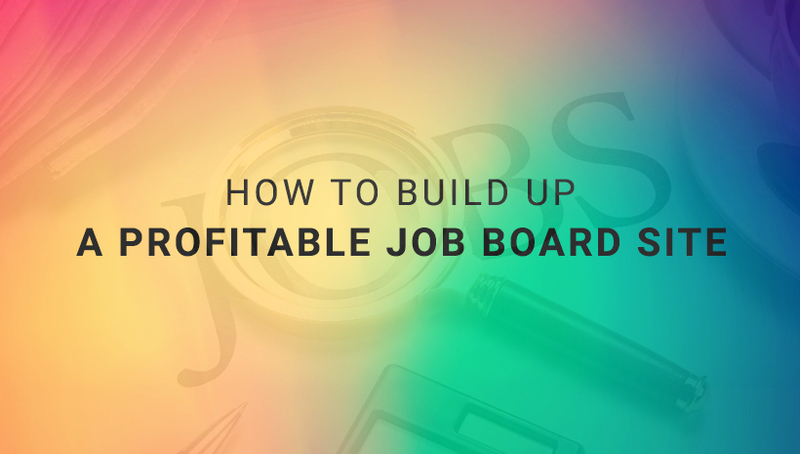 Starting a niche job board can be a great way to make a bundle of money; however, the business is not as easy as a pie to be successful, but not very tough to get profitable. The first thing you must do is building a powerful online Job board site which a decisive factor of your business is as though you are gonna run a small or massive job board business. The article will be a key to run a successful job board business with the list of fully essential steps. Let do a research to get the targeted successful job board site. Picking a niche for your job board will probably be the hardest part of this process. You need much time to research and target your job board business into. You must focus on what you are aiming to, candidates or employers, job listing types, detailing your business (IT job, babysitter, etc). For an inspirational source, you can get from the list of 100+ Niche Job Boards. You’ll see that there are plenty of opportunities to launch a job board that is highly focused and targeted. Starting your online business by getting your domain name done! Many domain registrars offer to host as an extra, but keep in mind that web hosting companies can also register domains. If you have an idea of which web host you’d like to use, check the details of its plans: you may be able to register a domain for free when you buy hosting, and that’s often the cheapest option. After choosing your niches, you should start setting up your online site with the first thing is selecting your domain from reliable domain name resources such as GoDaddy, Bluehost, Hostgator, etc. When selecting your domain, you must note that lots of web hosting offer domain flowing, so check it to get a free domain when buy hosting. Owning a profitable Job board site now is not very difficult with the list of awesome job board themes in WordPress which is functional and flexible. These themes don’t require you be good at coding and so easy to use. These 10 job board themes which we share below have the same premium design and functionality and they are highly customizable to suit your needs. Though you are in the need of creating a profitable job board theme or recruitment business, you should keep these themes in hand. Becoming an expert in job board and listing industry, Jobmonster gets more and more trusted customers who are keen on powerful features of Jobmonster such as Modern Job Advanced Search, Front-end Resume & Job submission, Easy installation and customization, Edition for Admin Review, Job Posting Pricing Plan, Email Notification and much more. Better than ever! The theme has launched a striking update which once again pushes JobMonster to the top with modern new look and trendiest functions in job board theme 2018. Finding something is simple, Careerfy will be a good option for you with offering the simplest solution to display jobs on any types of website. The job board theme tends to get everything done automatically that is a miracle thing for users, especially for newbies who are lack of coding knowledge. JobInn comes as a newbie in job board fields which is so competitive; however, the theme takes advantages of its strengths in offering a content-driven job directory theme which allows you to manage categories and job listings from the familiar WordPress UI. JobInn provides advanced search, front-end forms for job and resume submission. WP Job Manager Plugin empower the theme a lot to keep a certain position in this field. 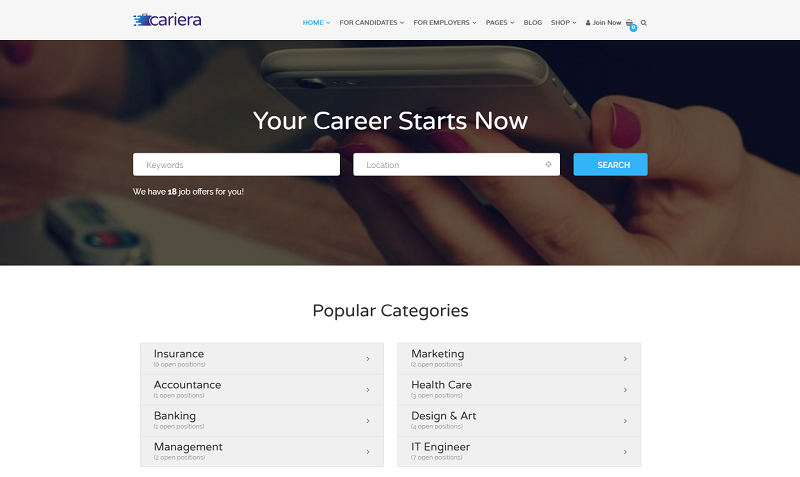 Cariera is a professional job board themes which greatly works on job boards, stats, and listing. The job board theme is distinguished from others by offering different homepages and super-easy installation with WPBakery Page Builder. Also, Cariera is a light weighted theme with high-speed performance enhancement, adaptable for all screens and browsers with retina ready quality will definitely be the perfect place for companies and job aspirants to connect. Workscout is a complete solution for building up a pro job board site for recruiters, employment agencies and any kind of job board business. The job board theme is empowered by the WP Job Manager Plugin which helps your building process much easier. InJob is an all-in-one job board WordPress theme which allows customers create a complete and fully responsive WordPress job portal, career platform to run human resource management. Also, the theme deserves users an easy way to customize job listing, from both the perspective of administrators and visitors as well. Craftory is Craftsmen Directory Listing & Job Board WordPress Theme which specialize in the jobs such as handyman, tradespeople, craftsmen or contractors web businesses. The beautiful eye-catching theme impresses users with the loading time, modern design, and payment method integration. Like Craftory, Handyman is a job board theme which dedicates users an easy way to create a job board, job listing or job directory site for electricians, plumbers, contractors, handymen etc. Everyone finds out the theme a convenient way to set up with the integration of WPBakery Page Builder. Also, the theme comes with a lot of elements so you can create any type of content you needed. TheJobs is perfectly designed for building up the site for recruiters, employment agencies and any kind of job office you can think of. The job board WordPress is empowered by WP Job Manager Plugin which gives users a super-easy way to customize the job board site. Last but not least, Jobcareer is still on the top list of best job board WordPress theme though it has been created for a long time. The theme gives customers a useful and easy to use job listings website, and a complete & fully responsive job portal, career platform to run human resource management, recruitment or job posting website. Like JobMonster, the job board theme also attracts more and more users after each updating version that keeps both of them in the modern trend. Make the job board site OUT and LOUD with a smart marketing strategy! Do a smart marketing strategy will be the best to promote your online store to your customers. It’s time to take advantages of both digital marketing as social media, mailing lists, Facebook Ads, and traditional marketing like print ads and more. For any change you do, you need to inform your customers by email or other methods. You can take advantage of these SEO tips to get more customers interactions. All in all, building an online job board site is not very tough; however, an online business that bundles your money is a difficult task, and you must keep a strict attitude when starting to run your business from the first step to the end. Hopefully, the article will aid you to run a successful job board theme that generates lots of profits. Thanks for reading!